When Marvel relaunched Silver Surfer in 2014 with the creative team of Dan Slott, Michael Allred, and Laura Allred, readers and critics noted how much the series felt like the Doctor Who revival series the BBC has been airing since 2005. [W]hen Tom Brevoort and I first talked about doing the Surfer book, we both approached it from the same angle. We both said, “Wouldn’t it be neat if you did a soft reboot the same way Russell T. Davies did a soft reboot of ‘Doctor Who?’” All the past continuity stands, but here’s a nice new way to look at it. The basic element we wanted to “borrow”—STEAL! [Laughs] was giving the Surfer a human companion; someone that grounded him, because for the most part. you look at Surfer and he’s this Shakespearean-spouting guy from the top of a bowling trophy. It’s hard to literally get under his silver skin. Giving him a human companion though, a character who’s eye-level to the reader, grounds him. And, indeed, the series does feel incredibly Who-like, down to some plots that bear an uncanny resemblance to major Doctor Who stories. Take the opening arc of the run’s second volume, for instance. After doing their part to restore the cosmos after the Secret Wars crossover, the Silver Surfer and his companion/love interest Dawn return to Earth, just in time for the planet to be invaded by the Surfer’s home planet Zenn-La. The Zenn-Lavian force, led by the Surfer’s ex, Shalla-Bal, then uses a device called the “Illuminatrix” to erase Earth’s culture and replace it with that of Zenn-La. As we watch, New York City transforms into a Zenn-Lavian cityscape, while its citizens find themselves wearing Zenn-Lavian fashions and supporting Shalla-Bal without question. Silver Surfer vol 8 #2 (2016). For those with even a passing familiarity with the Doctor Who revival, the arc bears more than a passing resemblance to the 2009-2010 two-part finale to Davies’ run on the show, The End of Time, in which the Doctor’s longtime nemesis the Master used an alien “immortality gate” to rewrite the DNA of every human on the plant to his own, creating a “Master race” of doppelgangers. The two-parter also features a broader Time Lord plot to bring about the end of time itself (hence the episode’s name), leaving only the Time Lords themselves in an otherwise empty universe. Doctor Who, “The End of Time, Part I” (2009). Basically, every major theme in the Silver Surfer arc was lifted wholesale from The End of Time. And yet… It still works. 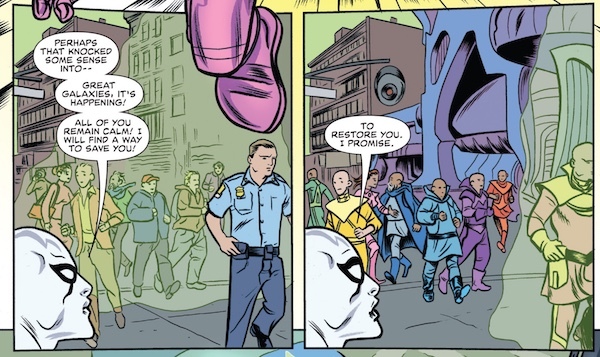 A large part of that is due to the stellar art by Michael Allred, with always-perfect colors by Laura Allred. Together, the Allreds make even a story this familiar feel fresh and new. They and Slott also do a good job of adapting the premise to the Surfer and his circumstances. While the Surfer may have committed many crimes during his past service for Galactus, it doesn’t lessen the hurt of wiping out the culture of his homeworld. Even when not directly “borrowing” plot elements from Doctor Who, the series maintains a strong Whovian feel. 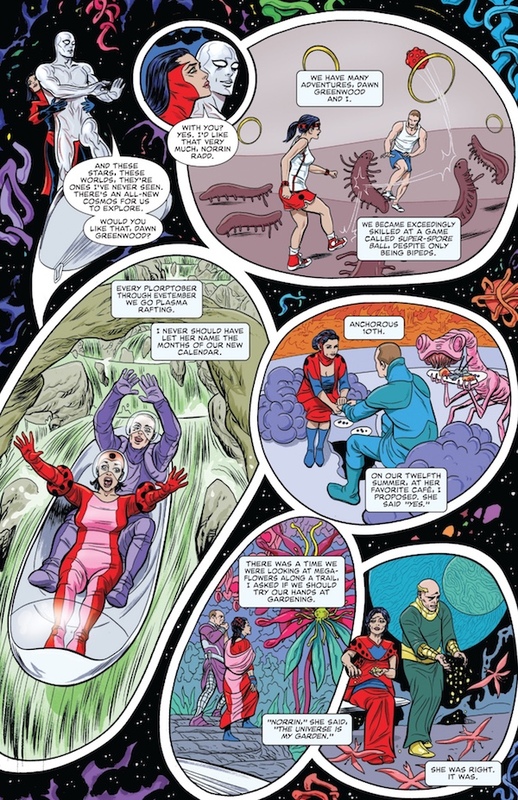 The final arc, in which the Surfer and Dawn are trapped in a prior universe before the Big Bang, is evocative of some of the best moments of Nu Who. Watching Dawn grow old and die while the Surfer continues on, never aging, feels like a Who story that hasn’t yet been told, but could be. The Surfer’s waiting patiently for billions of years from the Big Bang to the present also brought to mind the Doctor’s four billion year struggle in Heaven Sent to break through a diamond wall in order to get vengeance for the death of his companion Clara. Silver Surfer vol 8 #13 (2017). But while it has all the telltale signs of a knockoff, Slott and the Allreds make Silver Surfer a genuine delight on its own terms. It might steal some ideas from Doctor Who, but, honestly, that’s not a bad thing. As noted by T.S. Elliot nearly a century ago, “Immature poets imitate; mature poets steal.” In stealing from Doctor Who—without even a hint of apology—Slott and the Allreds made their Silver Surfer one of the best superhero comics of the past several years.